Tidal energy or tidal power is a source of renewable energy, obtained from the tides of an ocean. It is sometimes called another form of hydropower because it uses the energy of tides, which are made of water to generate power. These tides are produced in the ocean because of the gravitational pull of our moon and the Sun. These gravitational pulls cause the water to move across the different oceans, resulting in the development of tides. Tides are full of energy due to their motion. This energy is harnessed with the use of special devices, such as tidal turbines to generate electricity or mechanical power. The main advantage of generating power from the tides is that they are reliable and highly predictable. Unlike wind power, in which winds are unpredictable. Tidal energy is considered as a type of renewable energy source because we do not consume the tides in generating power from them. The concept of using the tidal energy for generating power is not new. Romans had known how to generate power from the tides. For this, they had built tide mills to generate mechanical power for grinding and other purposes. But, generating electricity from tides is a new concept. Only few power generating stations are producing electricity from them. 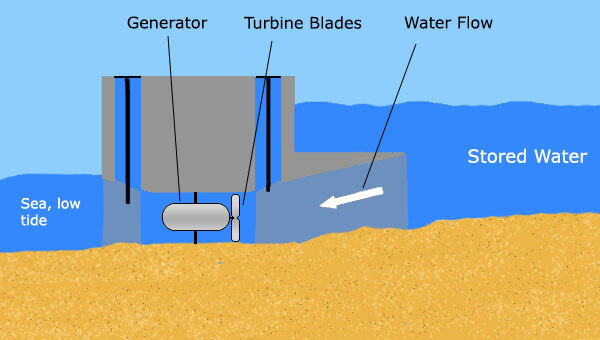 There are three main methods for generating electricity from the tides. Each method has its own advantages, depending on the geographical locations. Tidal streams (flowing bodies of water) that are created by the tides can be used to produce electricity. 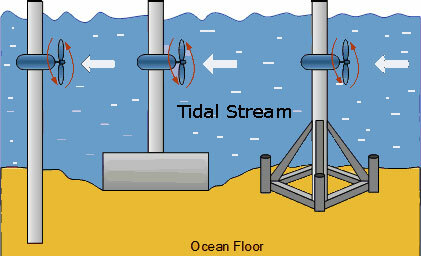 For this, tidal stream turbines are used to convert the flow of the stream into the electricity. These turbines are placed underwater and are fixed to the seabed for their support. Tidal stream causes the blades of the turbine to rotate, much like a wind But, water is denser than air, which makes its flow more powerful. Also, the blades of the tidal turbine are allowed to rotate much slower than a wind turbine Which helps sea creatures to avoid being caught in its blades. Placing the tidal turbines in shallow water near the shore proves to be more effective. Furthermore, it allows the ships to go around them. As a result, the hazard of their crashing is decreased. The first power to use the tidal stream is located in Northern Ireland. In this method, a dam-like structure known as tidal barrage is built. Tidal barrages are used to store and release water during high tides and low tides. The water is stored and released through the blades of the turbines that rotate to produce electricity. These turbines work in the same way like turbines in the dam. But, their rotation speed is much faster than the tidal stream turbines (discussed previously). The working example of the tidal barrage is the tidal power plant located at Rance River estuary in France. The main disadvantage of the tidal barrage is that it affects the environment significantly. Also, It disturbs the life of sea creatures, and many sea creatures can be caught in the fast rotating blades of the turbine. In this method, an artificial barrier is made to enclose some area of the ocean near the coastline which is known as a tidal Tidal lagoon works in the same way like the tidal barrage i.e. turbines will work during filling and emptying of water in the lagoon. But, there no working example of generating electricity in this way. Although, china is building a tidal lagoon power plant near its border with North Korea at Yalu River. Tidal lagoons have a low impact on the environment as compared to tidal barrages. When high tides arrive these lagoons completely submerge in the ocean, allowing sea creatures to swim across it. 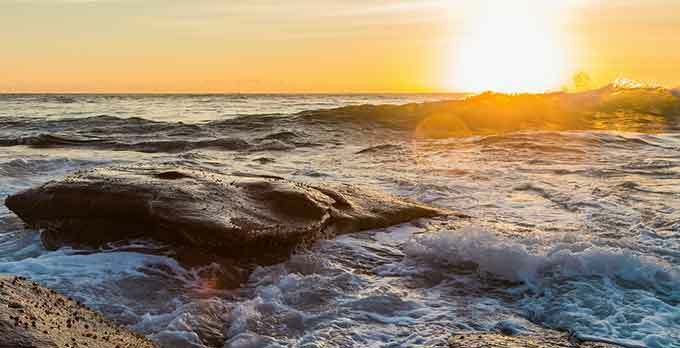 Tidal energy is a type of renewable energy, which doesn’t pollute the atmosphere. The tides are highly predictable, which allow the engineers to design a power plant that can operate for years. Unlike the winds, which are unpredictable. Tidal barrages may also protect land against flooding during high tides. The main problem with the development of tidal power plant is the cost of building its structures and the cost special machinery, which is required to produce electricity. Power generating stations can be built only at the few sites that are suitable for power generation. Tidal power plants are harmful to the marine life. Abdul Wahab, "Tidal Energy," in Science4Fun, April 13, 2019, http://science4fun.info/tidal-energy/.